Chief Skedans Totem. Copyright 2012 Robin L. Chandler. Brahms’ Requiem is a prayer for the living, and it begins “blessed are they that mourn, for they shall have comfort.” I’ve been listening to it for days, seeking comfort, because a dear friend passed away on Saturday night. Last week, I found myself standing in Stanley Park, Vancouver, awestricken before a totem carved by Haida artist Bill Reid. 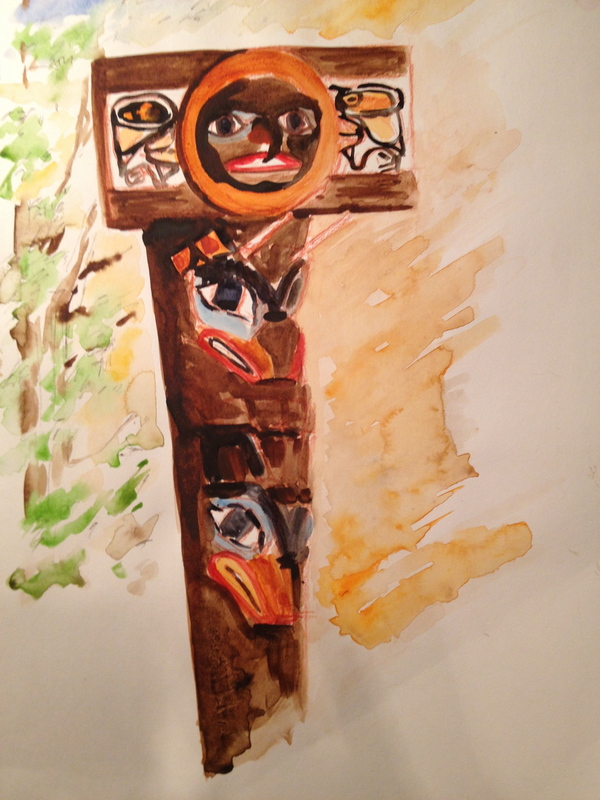 Recreating a pole carved in 1870 in the village of Skidegate, Queen Charlotte Islands, the totem honors the passing of the Raven Chief Skedans; images of the Moon, Mountain Goat, Grizzly Bear and the Whale grace its visage. The Chief’s daughter erected the pole as a memorial honoring her father’s passing. I was in Victoria when Laura Tatum passed away. 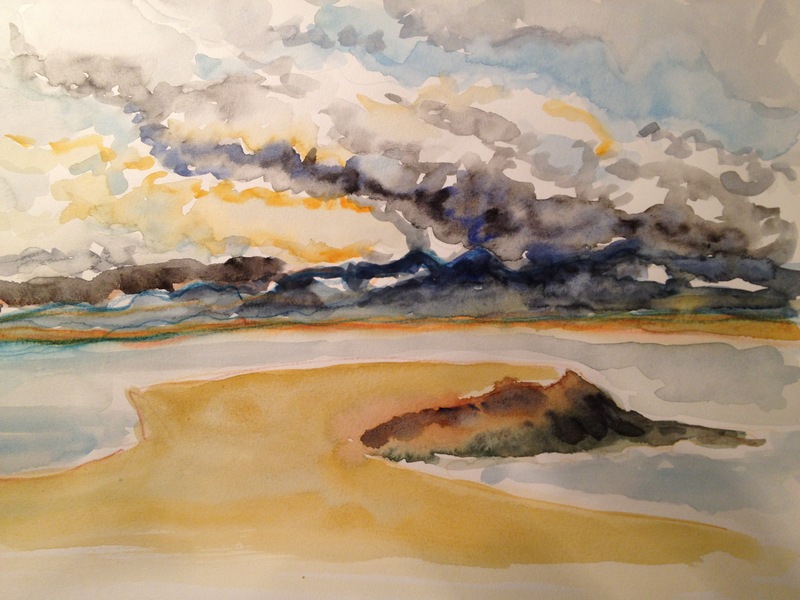 In the tradition of the memorial totem, I offer these watercolors today in remembrance of Laura. My friend Laura brought an extraordinary sparkle and passion to all aspects of her life. Laura had a smile that could light up the darkest of rooms. She was a superb archivist who specialized in architectural records and broke new ground engaging architects in arrangement and description of their archival collections. Work has brought me to the Pacific Northwest & British Columbia several times in the last year: Portland, Seattle, Vancouver, and Victoria. 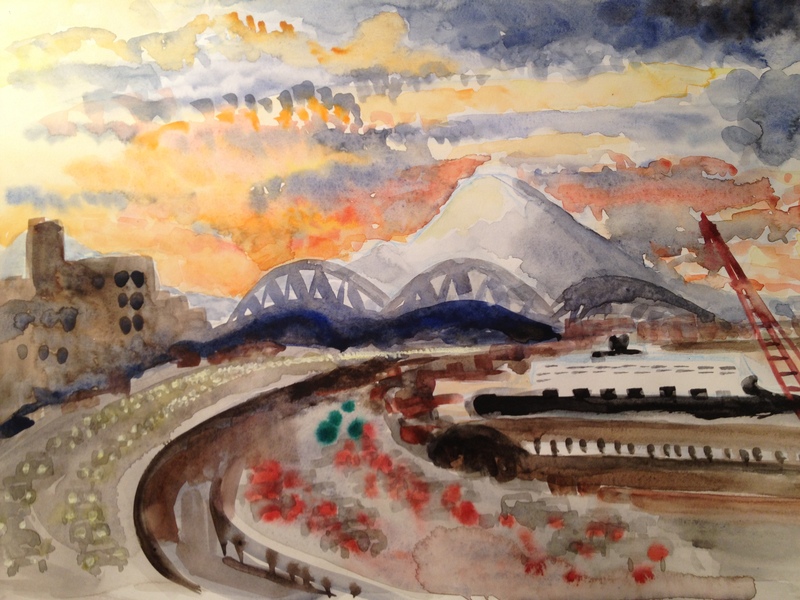 I have attempted to capture the region’s beauty in my watercolors. View of the Olympic Range from Victoria. Copyright 2012 Robin L. Chandler. In my mind’s eye, I see Laura, a native Oregonian, flying magically and Marc Chagall-like in the heavens over the rooftops and green space of the Pacific Northwest and British Columbia. Her journey takes her northward from Oregon along the Cascade Range to Mount Rainier, westward to the Olympic Range, and northward again across the Strait of Juan de Fuca towards Vancouver and Victoria, her spirit living and loving, ever inspiring us to live life to the fullest. With this magic, I shall have comfort. A lovely tribute, and beautiful paintings. I’m especially taken with the cars in the second painting, and the beach in the third. The northwestern sky is so mercurial. Hey Rob, I just stumbled on these browsing through Laura’s FB page on the day of her memorial service. Beautiful sentiments, music, and watercolors!